Learning the alphabet typically occurs in steps, beginning with knowing the letter names. It typically begins with learning the ABC song, followed by identifying upper- and lower-case letters as well as different print styles (“a” and “g”). Lastly, a child must learn that each letter represents a sound. A child must learn each letter’s most common sound first. The table below contains each letter’s common sound as well as an example. 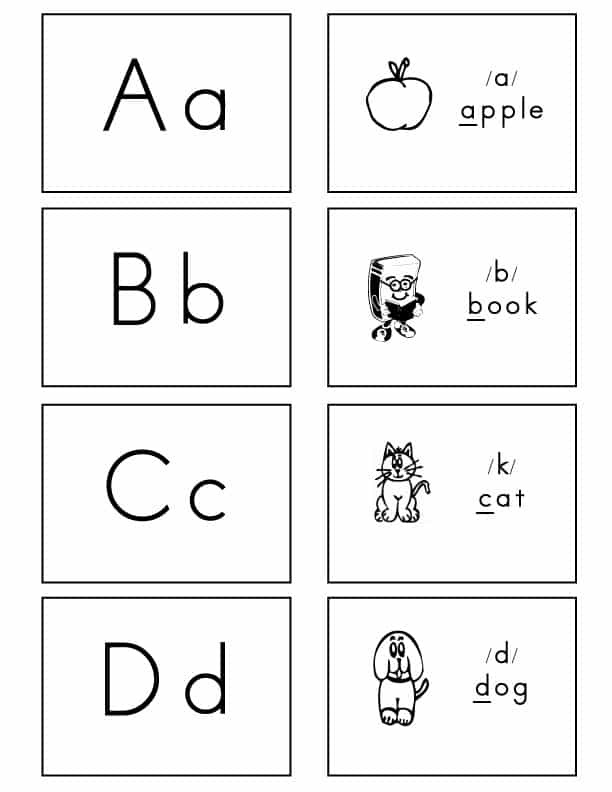 If you click on the image above, you will get a PDF file containing alphabet flashcards. Both of my children learned each letters common sound using alphabet flashcards and a DVD – Leap Frog: Letter Factory . There are many free apps and computer games that also help a child learn the letter sounds. Educators recommend introducing the “easy” consonants first (high frequency & contrast) and then the short vowels. As noted in the table below, some sounds are more prevalent than others. Some educators recommend introducing a few consonants and a short vowel so simple words can be formed. If you introduced the letters a, m, s and t, you could form words, e.g., am, as, at, sat & mat. This approach can form more words than if you introduce the letters in alphabetical order. When selecting a few consonants, do not group confusing letters together, e.g., b/p, d/q, b/d, p/q, m/w & u/n. The following consonants are considered easy consonants (high frequency/contrast): T, N, R, M, D, S, L, C, P, B, F & V.
Rath, L.K., Ed.D & Kennedy, L. (2004). The Between the Lions Book for Parents. New York, NY: Harper Collins. Vaugh, S & Linan-Thompson, S (2004). Research-Based Methods of Reading Instruction. Alexandria, VA: ASCD.